Dabcyl is one of the most frequently used fluorescence quenchers. However, the very poor solubility in aqueous solutions due to its hydrophobic properties limits its use in biological systems where the natural solvent is water. The present invention provides a new dark quencher called Hydrodabcyl, which represents the hydrophilic alternative to Dabcyl. 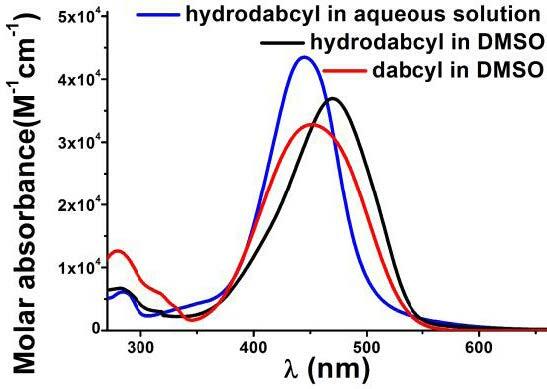 The spectroscopic properties of Hydrodabcyl are similar to that of Dabcyl. The present invention provides a convenient and reliable new dark quencher for FRET-based applications. 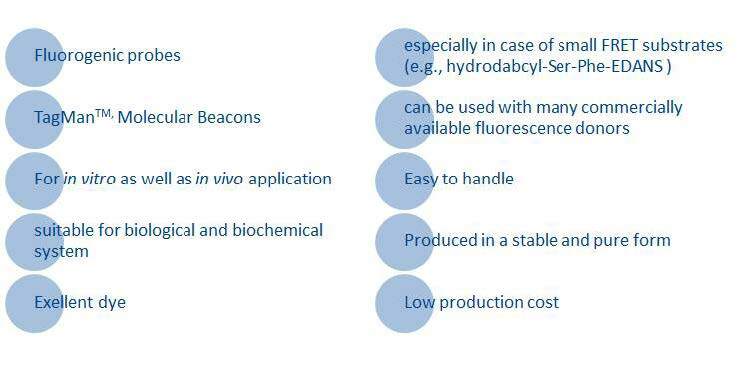 As a water-soluble agent, Hydrodabcyl can be used in a large variety of biological and biochemical systems and is an improved alternative to the very popular Dabcyl for the design of fluorogenic probes. Due to its non-immunogenic and non-toxic properties Hydrodabcyl is highly suitable for in vitro as well as in vivo applications. Proof of concept, ready to use.